The dream of having a bridge to Rikers Island was officially realized on Tuesday, November 22, 1966, when Mayor John V. Lindsay was on hand to dedicate this structure as the nucleus of future building plans for the Department. reduction of new construction program costs by $1 million a year over the next five years. elimination of $500,000 annually in ferry maintenance and operating expenses. reduction of delivery costs for institutional supplies and equipment by $150,000 per year. elimination of $300,000 annually in portal-to-portal time lost by personnel in daily ferry service delays. At ribbon cutting for Rikers bridge (from left to right): Queens Borough President Mario J. Cariello, the late Public Works Commissioner William C. Mattison; Mayor John V.Lindsay; Commissioner and Mrs. George F. McGrath; and Transportation Administration Chairman Arthur E. Palmer, Jr.
Not represented in dollars and cents is the convenience of easy accessibility for staff, inmate visitors, other agency personnel, lawyers, emergency staff and equipment (it is now possible for city-based fire equipment to respond to fire alarms), professinal service staff, college and university staff engaged in research, and the many civic groups interested in correctional agency operation. 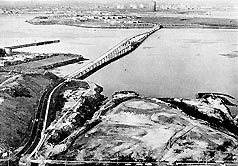 Construction of the bridge, located at the foot of Hazen Street and 19th Avenue, Astoria, Queens, and connecting with the southern portion of Rikers Island, was started on June, 10, 1964. The engineers were Madigan-Hyland, Inc., and the general contractors were Brookfield Construction Co., Inc., and Moore-Lopier Corporation. The Department of Public Works supervised all planning and construction contracts. The Commissioner, in his address at the dedication ceremonies, also commended Mr. Joseph Batka, Chief Architect of the Department of Correction, and his staff, for their pioneering efforts in developing the original idea of a bridge connecting Queens with Rikers Island. It is of fixed low-level construction of structural steel and concrete with a 52 foot rise allowing the uninterrupted passage of vessels beneath. The main stream of the river on the west side of Rikers Island will continue to service the heavy ship traffic. The 5,500 foot bridge has a thirty-four foot three-lane roadway and a six-foot walkway. Mayor John V. Lindsay took this opportunity to commend Commissioner McGrath and the late Public Works Commissioner William C. Mattison for their efforts in expediting the construction of the bridge and was pleased to note fiscal savings that would be realized through its construction. New York City Correctional Institutions for Women, estimated cost $22,000,000; construction to begin April 11, 1967. C-73. Adolescent Remand Shelter, estimated cost $22,000,000; final plans 90 per cent complete. C-74. Power Plant addition, estimated cost $9,990,000; Part I and 11 plans 95 per cent completed; Part III to be initiated in 1967-68. C-84. Bridge Control House-estimated cost $660,000; construction contracts awarded. P.W.182. Adolescent Division Housing Addition of 496 rooms, estimated cost $6,000,000, construction underway with expected completion in early 1968. C-71 Phase V.
Modernization of Adult Division Chapel and Auditorium, estimated cost $200,000; Department of Public Works plans 70 per cent completed. C-75. An important and intangible benefit of the bridge is evident in discussing its operation with personnel on the Island. They are unanimous in agreeing that they now get home from work a half hour to an hour earlier. They are particularly pleased by the lack of delays formerly occasioned by inclement weather. Ferry service meant long delays due to fog, storm and dock breakdowns. And last but not least, it is estimated that the bridge will pay for itself within ten years through economies effected.